Thomas Bazan was born in Houston, Texas and has had early influences in all types of music such as rock, R&B, jazz, reggae, and funk. Thomas is a one of a kind drummer that can lock into the pocket of any genre of music. He has been a master of his skill for sixteen years and holds strong dedication, persistence, and passion. Thomas' background is accented with concert/battery percussion, five-year drummer of the UIW Jazz band, National touring artist for Dub South Records' Sol Tribe (SA), and has successfully toured with countless reggae bands from 2013-2018. Some of Thomas' biggest accomplishments were performing over sixty shows in thirty-five states over a time span of four months and shared the stage with California reggae bands such as Stick Figure, The Expanders, and Tribal Seeds. Thomas followed a life in music growing up in school and continued to study music in college. He obtained his degree in Music Industry Studies (B.A.) from the University of the Incarnate Word in the fall of 2016. 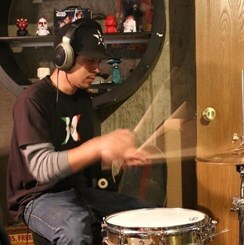 He is now currently working and drumming for a local Austin, Texas ska band called The Inverters.